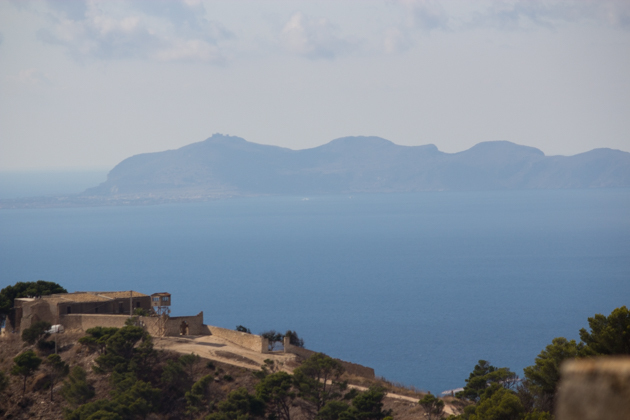 We explored the south-western part of Sicilia (Sicily) starting with a drive from Palermo to Erice. 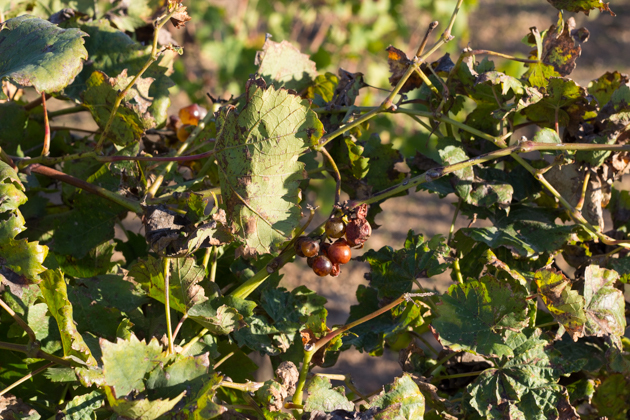 The land was arid and rocky dotted with rows of vineyards. 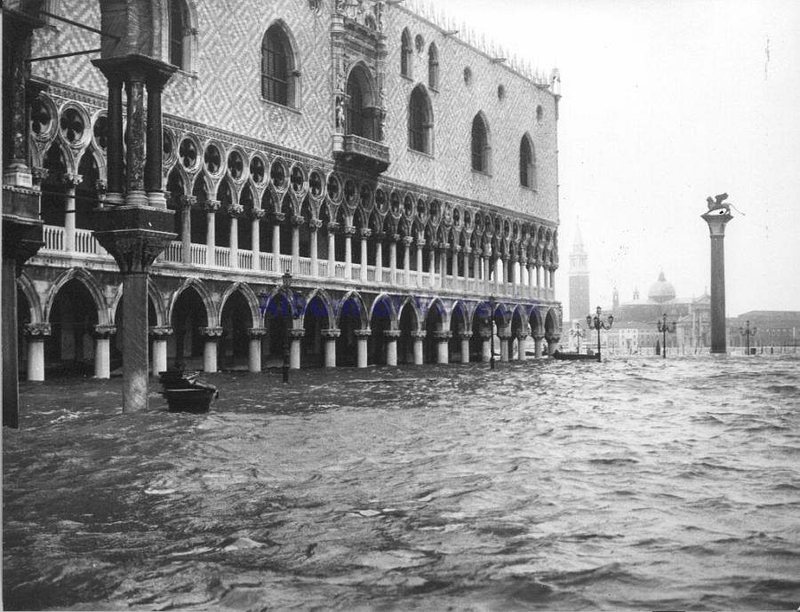 It feels more like North Africa than Italy now. 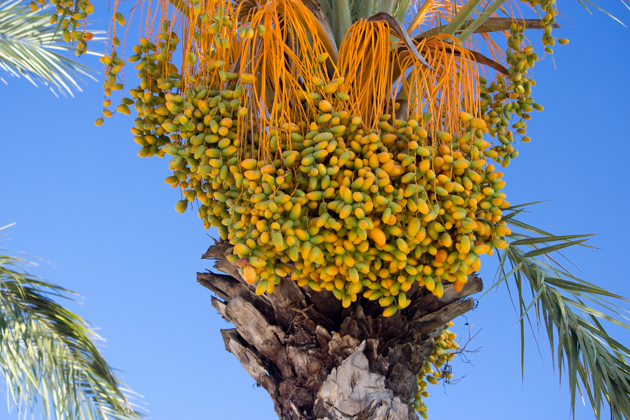 Dates grow on the palm trees, rows of pomegranate trees and fig covered cacti line the walls. 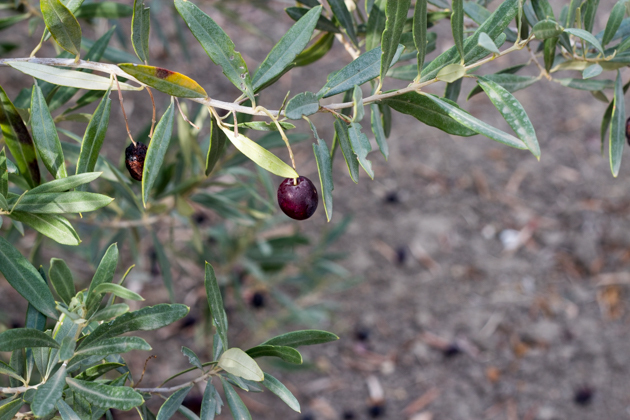 Dwarf olive trees glint a silvery green in the sun, their growth stunted by the strong winds. 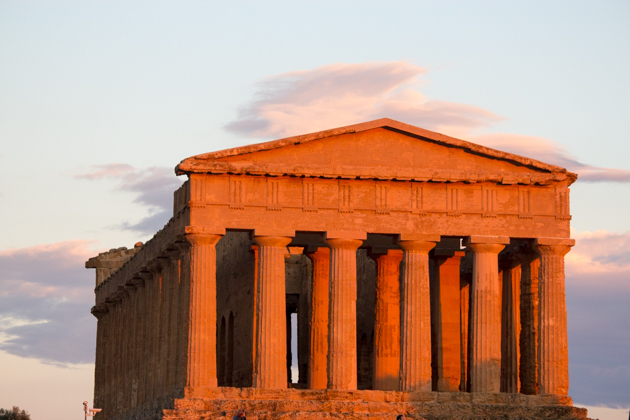 Sicily is divided into four culinary zones: Palermo, Siracusa, Catania and Messina although even within a single zone there are many variations. 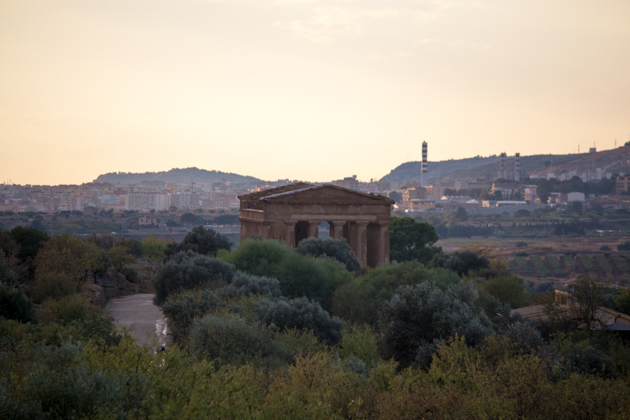 We wanted to explore western Sicily, known for having the strongest Arab influence. 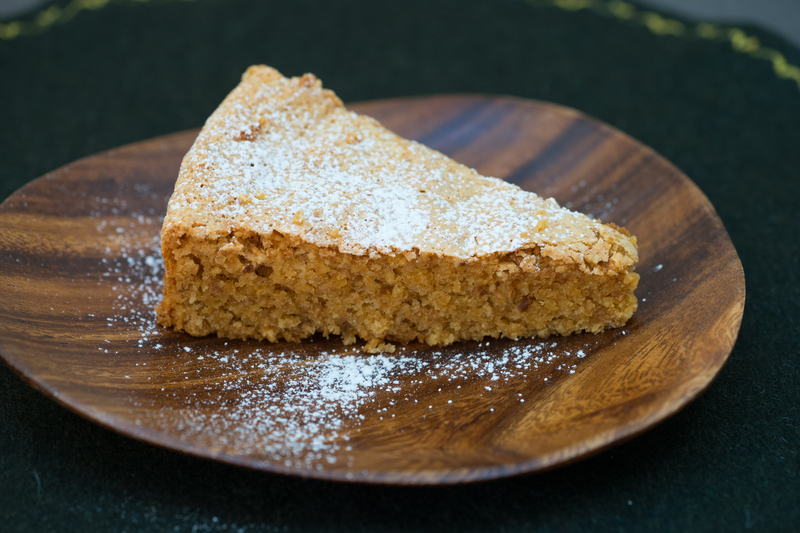 The Arabs introduced their skills in pastry making, which became a speciality of the convents which jealously guarded their recipes as they weren’t available elsewhere. 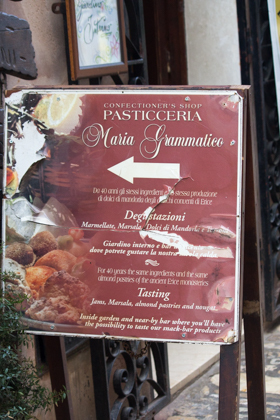 In Erice, one woman left the convent (with a head full of recipes) and began producing their sweets in her own shop. 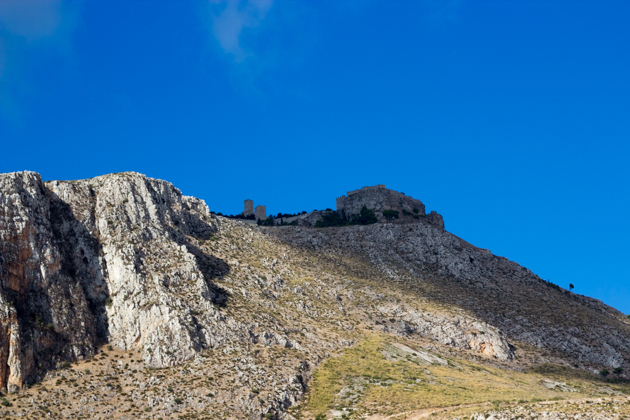 Erice sits on top of a mountain with panoramic views all around. 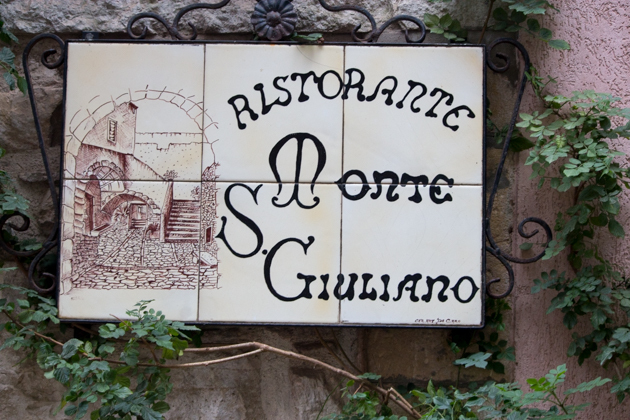 The town is known for pastries and is home to one of the most famous pastry chefs, Maria Grammatico. Maria was one of six children from a poor family. Many poor families at that time felt it was prudent to have a member of the family in the church and one less mouth to feed, so at the age of 11 she was sent to work for the convent. Life was difficult and lonely but she learned the nun’s secrets to pastry making. After 15 years she set up her own shop using a wood burning stove and only almonds from Avola. She was less than popular with the nuns who would not allow her any moulds to make the pastries. 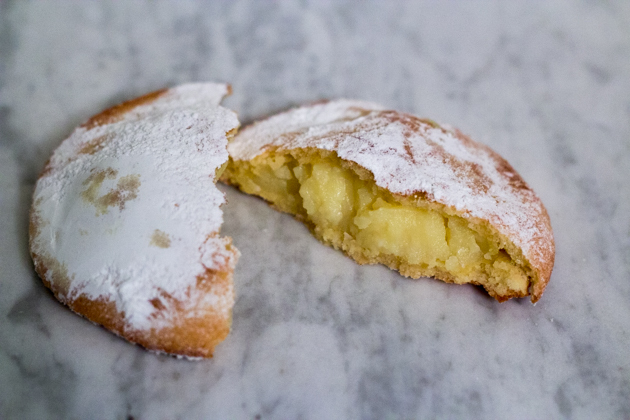 Today she is world famous for her pastries, particularly those made with almonds and her Genovesi (a large pastry ravioli filled with custard). A curiosity of convent baking is the number of sexually suggestive baked goods such as i segni di vergine (meaning “virgin’s breasts” and are made of almonds, sugar and citrus flavoured jam) and cannoli (a phallic baked or fried pastry cylinder filled with ricotta cream and candied fruit and/or chocolate drops). It is perhaps unsurprising as baking was their only outlet from a lonely life of hard work. 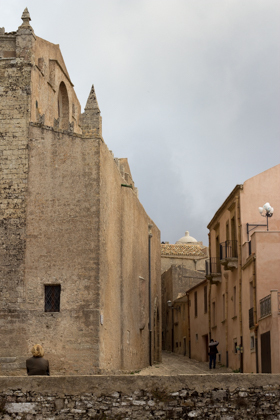 Whoever thinks beige is not beautiful has never been to Erice. The whole village is made out of stone, a tapestry of different textures. 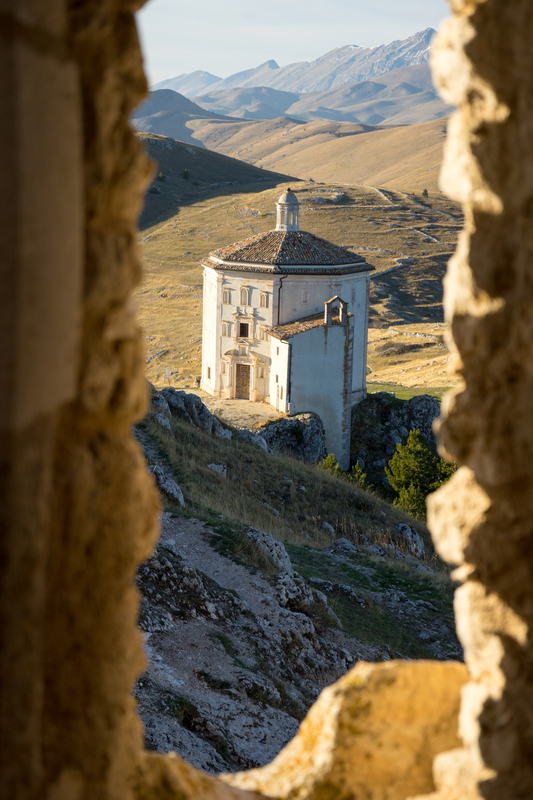 The 14th century Chiesa Matrice and its Bell Tower are raw stone, with its simplicity beautiful in itself. 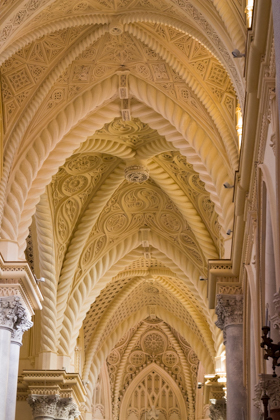 Upon entering, the interior is breathtaking with smooth ivory carved stone in intricate detail covering the ceiling and altar. 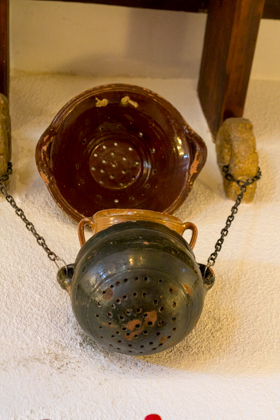 A traditional earthenware couscoussiere (perforated pot) which rests over a pan of boiling aromatised water to steam the couscous within. The gap between the couscoussiere and the pot is sealed with dough. 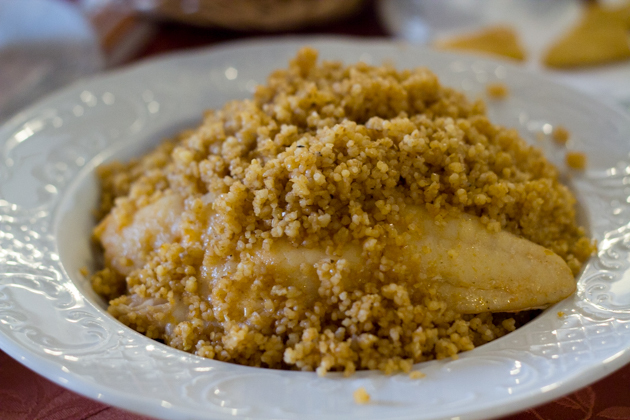 Lunch at Monte San Giuliano, next door to Maria Grammatico’s pastry shop, is popular with tourists as it has good traditional dishes including cuscus alla trapanese (couscous served with fish stew (agghiotta di pesce)). 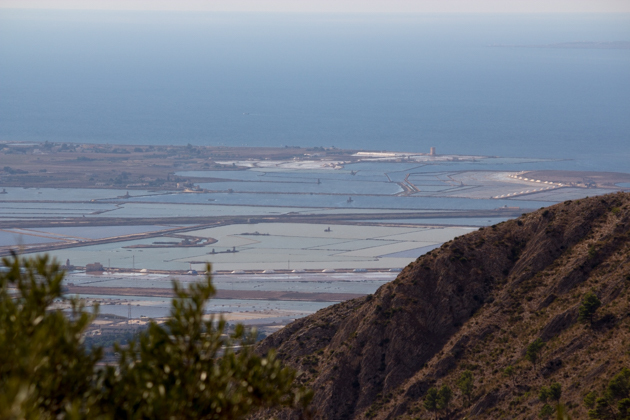 Erice overlooks Trapani along the coast with its salt yards. 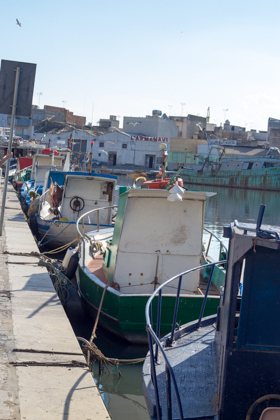 Trapani is known for its fish couscous, an import from nearby Africa. 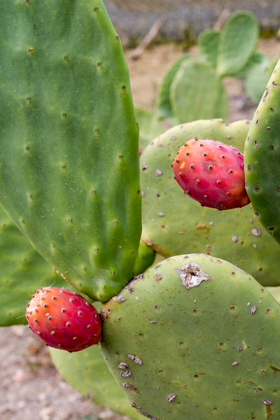 From Trapani one can take ferries to Pantelleria, an island known for being closer to Africa than Italy, its flavoursome salt-packed capers and its nectar-like passito style sweet wine made from Zibbibbo grapes (my favourite producer is Donnafugata). 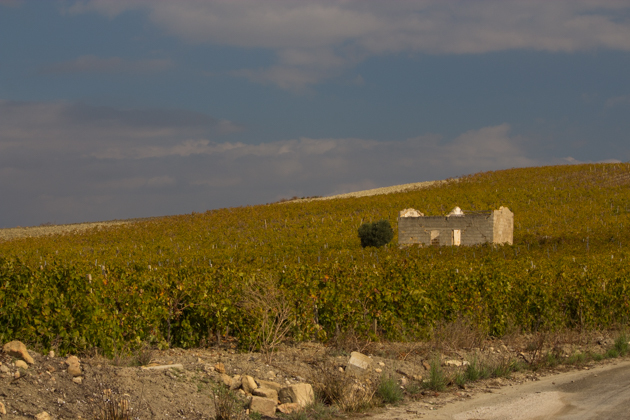 Also try the unique dry Zibbibbo wine by De Bartoli. From Trapani it is also possible to take a ferry to the island of Favignana, a magical island known for its cliffside tufa caves filled with secret gardens or pools of water. 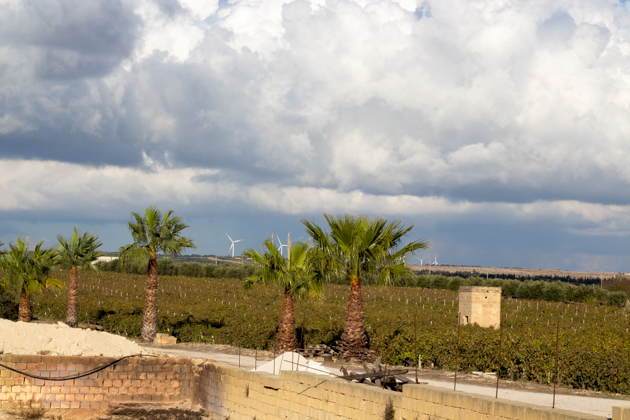 Further south of Trapani is Marsala, known for its sherry-like wine. 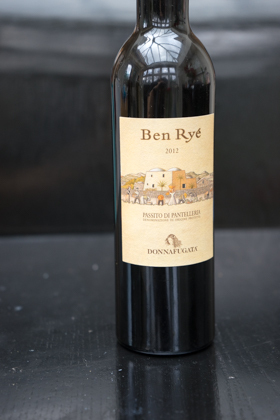 While most Marsala wine is unremarkable and industrially produced we visited one of the lone artisanal Marsala producers, De Bartoli, which is covered in a separate blog here. The landscape begins to feel more Arab and North African and the air feels hot and dry. 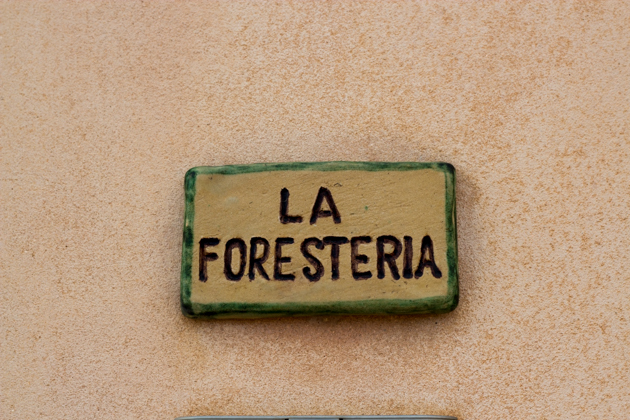 We used Mazaro del Vallo as our base camp to explore the local area as we found a hotel which catered to children. Mazaro itself is not particularly scenic and is known for its sizeable North African population and its port. 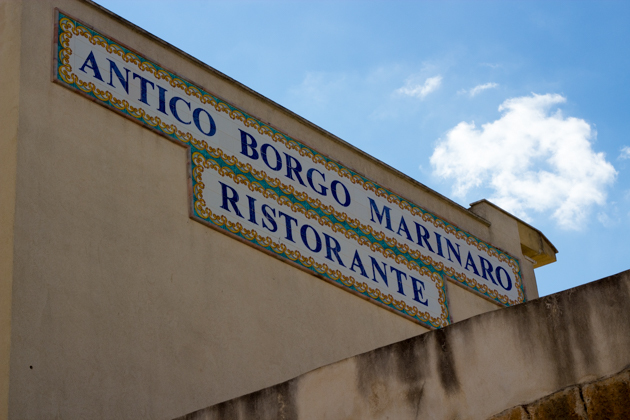 We found an excellent seafood restaurant along the water, Antico Borgo Marinara. 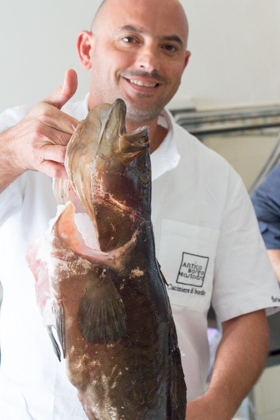 Its convivial chef owner, Bartolomeo Marmoreo was obviously proud of the fresh white sea-bream, grouper and John Dory he procured which he expertly prepares being careful not to overpower the delicate seafood flavours. The restaurant’s elegant decor reflects the location, combining Sicilian colourful hand-painted tiles with the domed roof and arches reminiscent of the Arabs. 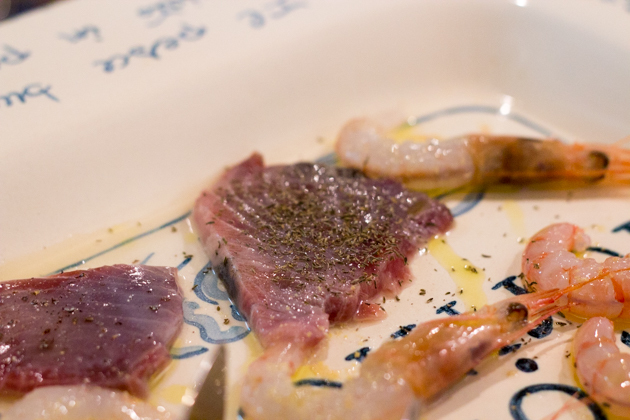 We had smoked swordfish bruschetta with oregano and the raw seafood platter of prawns, langoustines and tuna sashimi sprinkled with local Sicilian oregano (“Salamarigghiu” in local dialect) which the chef harvests himself alongside the sea. Nearby is Valle di Belice, a beautiful valley of crumbling stone farmhouses, copper to green vineyards and silvery olive trees. 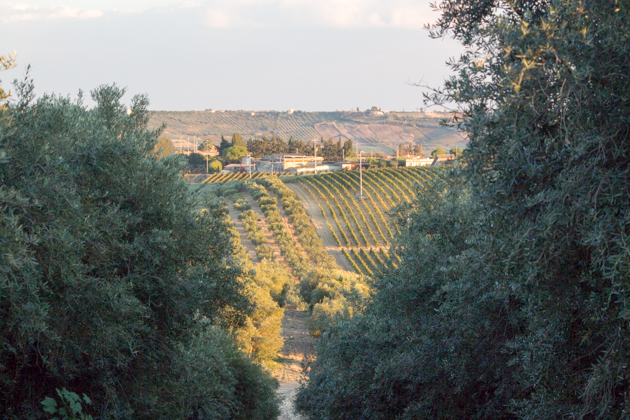 The area is famous for Nocellara di Belice olives and olive oil, Valle di Belice sheep which produce ricotta, vastedda (a rare pulled sheep’s milk cheese), pecorino siciliano and pane nero di castelvetrano (bread made from the ancient Sicilian grain Tumminia). We visited a caseficio (dairy farm and cheese maker) and a traditional mill stone grinding ancient Sicilian varieties of wheat (covered in detail in separate posts). 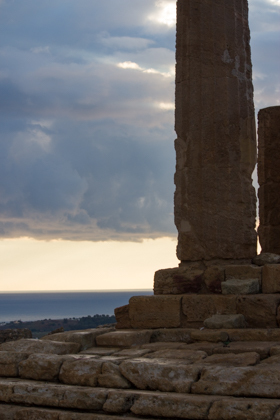 Further east is Selinunte, famous for its ancient ruins. 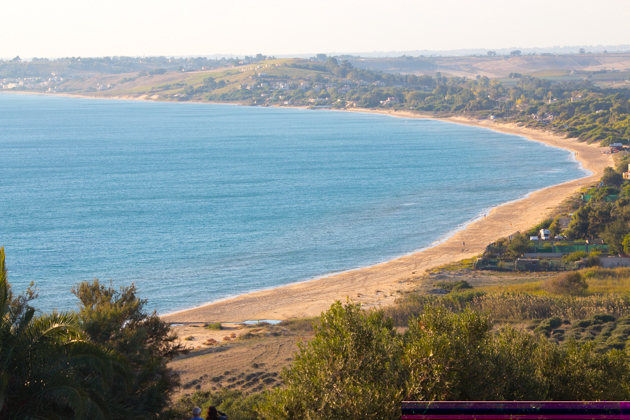 Along the beach in Selinunte is a beautiful place to watch the sunset and here you will find, La Pineta, a laid-back beach shack serving well prepared seafood dishes. The waves lap at the front of the restaurant while you eat Sicilian specialties like pasta with sardines, pasta with seafood and grilled swordfish, sardines and calamari. 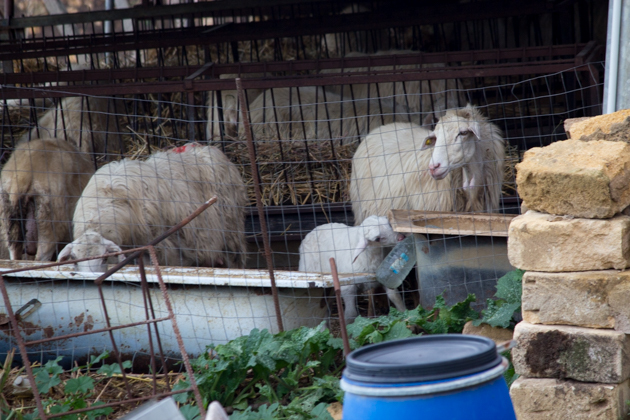 In the town of Castelvetrano, near Selinunte, we discovered a very simple trattoria run by local legend, Giovanni. As I have had worse meals at upscale restaurants in Italy than in simple trattorias, I knew that the price of the food is not a reflection of the quality but rather your surroundings. 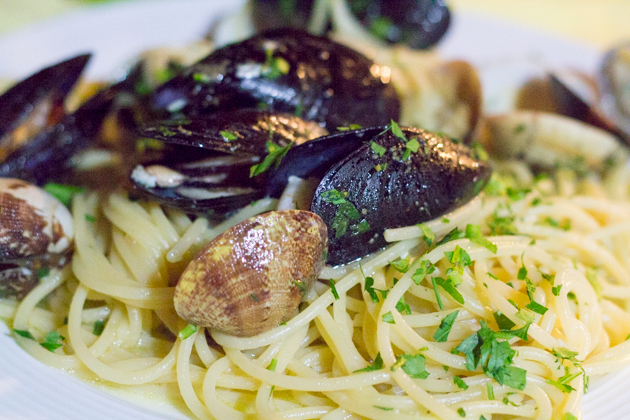 Da Giovanni‘s is the perfect trattoria serving simple but excellently prepared food one would eat in someone’s home. We had a simple Sicilian minestrone made with artichokes, peas, broad beans and ditalini pasta and grilled fennel flavours sausage and salad. After he brought a bowl of local oranges and grapes sitting in ice water. Food for the soul. 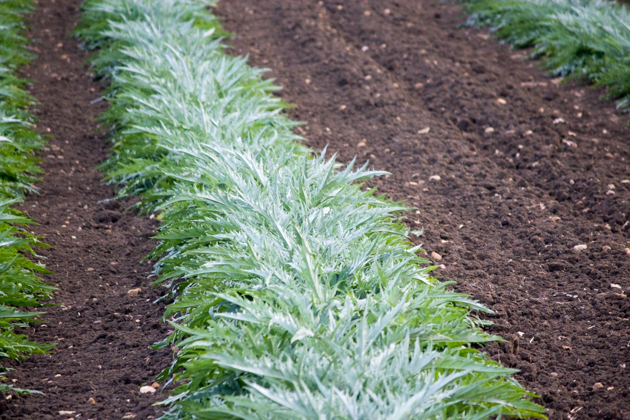 We spent a couple of days in Menfi, known not only for wine but also for its artichokes. 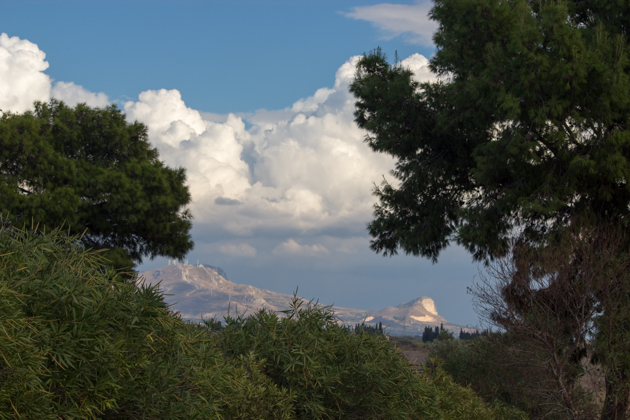 Planeta has big presence in the area with two sites encompassing a wine estate, restaurant, hotel and an olive oil estate. We spent a morning in Planeta‘s kitchen cooking Sicilian specialties with their chef, Angelo Pumilia. Angelo revealed his grandmother’s secrets as well as his philosophy towards good food beginning every time with a history lesson. His passion for food was palpable and the results were not only delicious but lighter than anywhere else we had eaten. 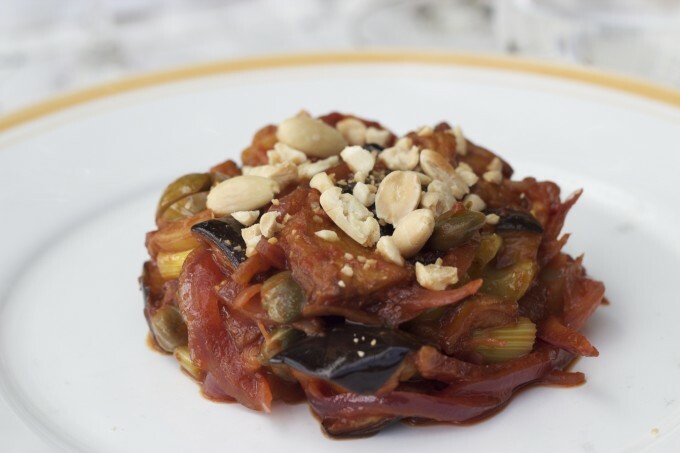 We made Caponata which he described as a quintessential Sicilian fusion between the influences of the French ratatouille and the Arab sweet and sour sauce. Variations abound with zucchini, peppers, potatoes, olives, artichokes, apples, anchovies, sardines, chocolate, basil, pine nuts instead of almonds, tomato paste instead of fresh tomatoes, honey instead of sugar and sultanas. Next we made busiate con pesto trapanese (fresh semolina and water pasta with almond, basil, garlic and tomato sauce- similar ingredients to the Spanish gazpacho). For anyone confused about the pesto variation, pesto just means “to pound” so can be made with any pounded ingredients. 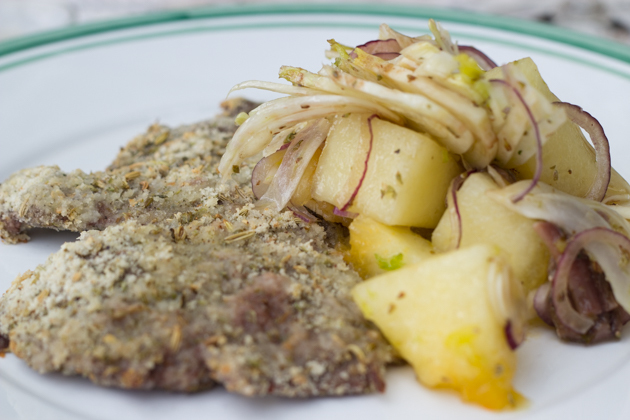 For the main course we made with veal escalopes coated in flavoured breadcrumbs and accompanied by melon, anchovy, onion and oregano salad. 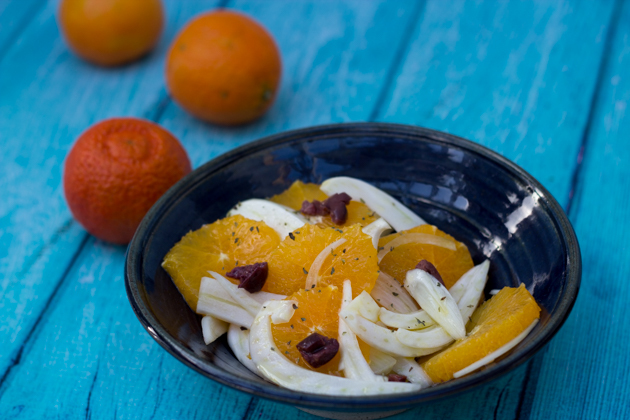 The salad is a winter variation on the traditional Sicilian orange, fennel and olive salad. We finished off by making what I think were the best cannoli I had ever eaten. I was slightly scarred by the versions I have had in New York with a dark thick, flavour-less shell encompassing what tasted like sickly sweet sugar paste. 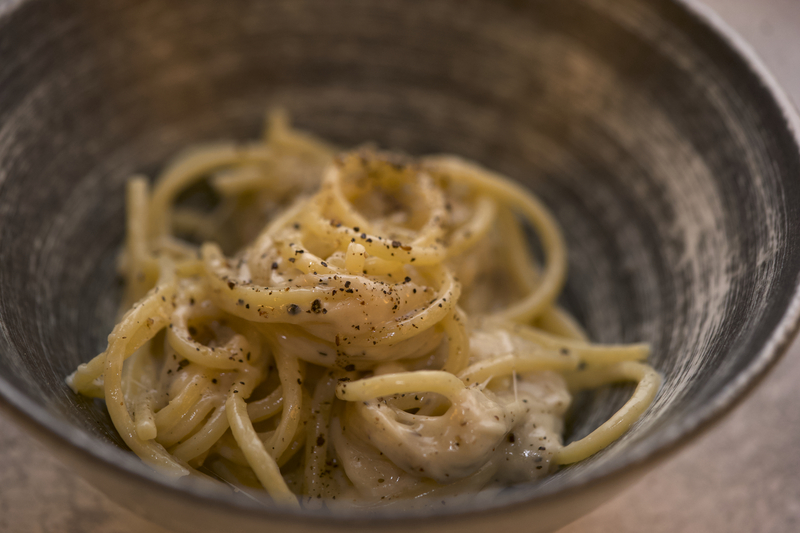 His were feather light and thin with slightly sweet fresh sheep’s milk ricotta. 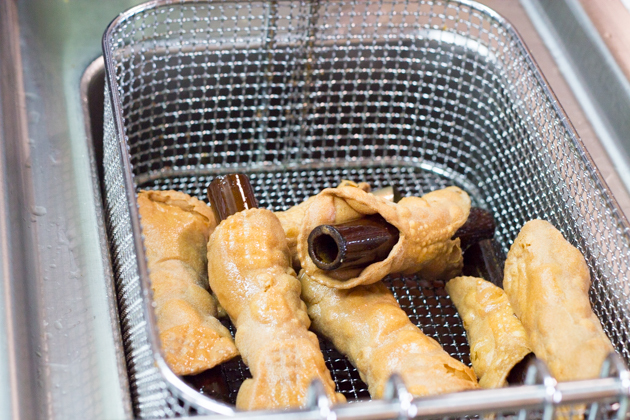 Angelo explained that the best cannoli were made at home as the shells could be made thinner as they were filled at the last minute so had no risk of becoming soggy or breaking. Dark shells are an indication that old oil was used to fry the shells. He uses a ratio of 16% sugar to ricotta whereas traditionally it was 44%, resulting in the perfect sweetness. 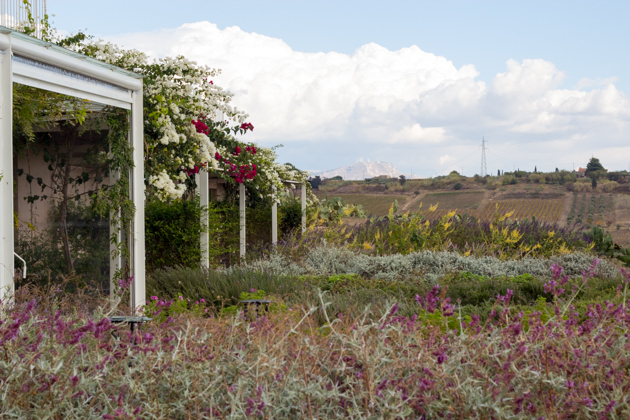 We enjoyed the fruits of our lesson on the terrace overlooking the vineyards amongst the herb garden. A perfect morning. 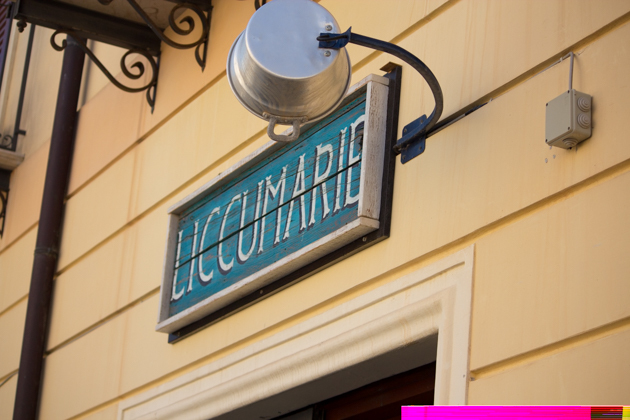 Also in Menfi is Liccumarie, a modern trattoria filled with convivial families the day we dined. 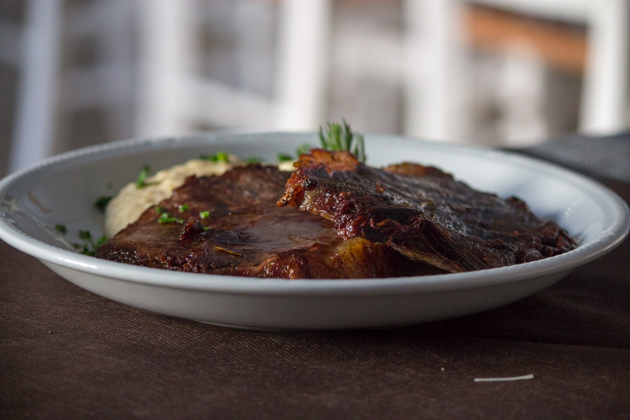 Try their beef braised in olive oil or their bavette steak with pistachio and almond sauce. 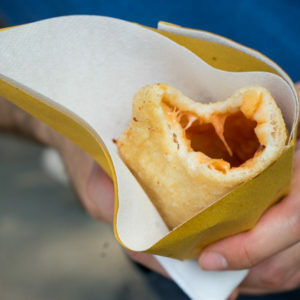 Local specialties from the Menfi area include arancini (filled rice croquettes), savoiardi di zinna (lady finger’s biscuits), rosticceria (sausage roll), baked and fried calzone (pizza pockets filled with ham and cheese), ravazzate (dough filled with ham and cheese), granita (ice slush), pezzo duro (ice cream covered with chocolate, nougat and candied almonds or black cherry and candied fruit), sardines with salmoriglio sauce (oil, mint, garlic and lemon), torta Savoia (a cake invented by Benedictine nuns to celebrate Italy’s annexation of Sicily) and croccante di mandorle (almonds candied with honey and spices introduced by the Arabs). 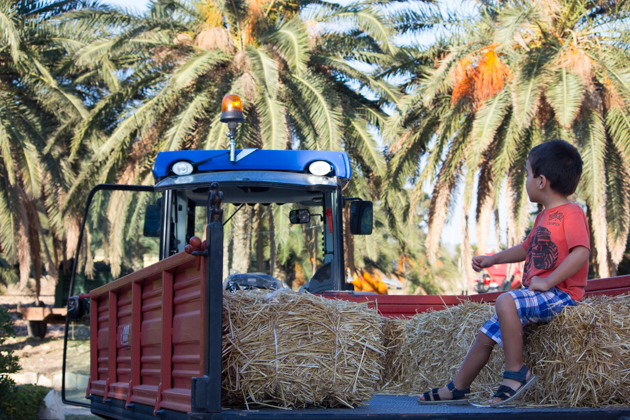 A fiddler accompanied the tractor ride! 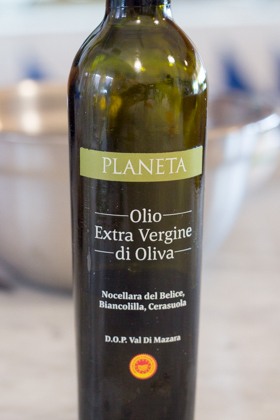 We spent All Saint’s Day at Planeta‘s other Menfi estate, Capparrina where they make their olive oil. 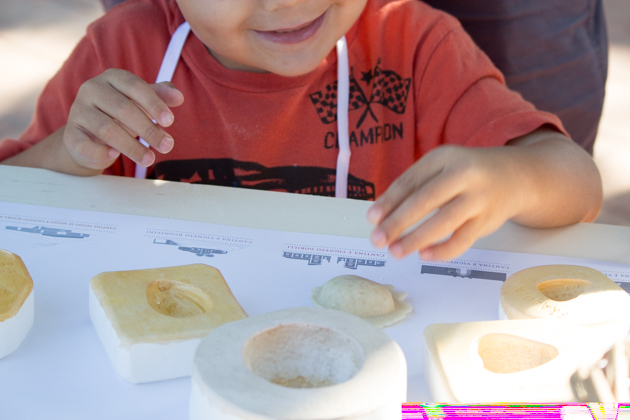 Our children made frutta Martorana, a convent specialty from the Martorana church in Palermo consisting of marzipan moulded into fruit and vegetable forms and painted. 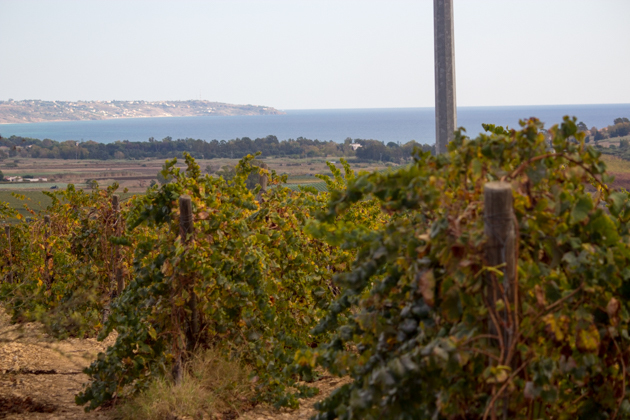 We took a tractor ride around the 98 hectare estate overlooking the sea. 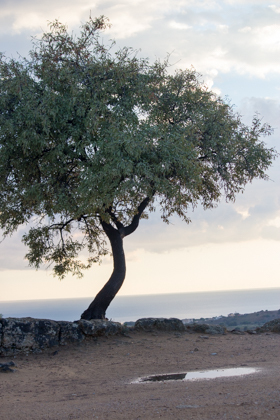 They placed hay bales on back for us to sit on and we were accompanied by a violist and cellist while we viewed their 24,000 olive trees glinting in the sun. The perfect conclusion to the perfect holiday. To see the illustrated step-by-step recipe, click here. The restaurant is popular with tourists but prepares tasty dishes nonetheless. Portions are large. Recommended dishes: Pasta with prawns and artichokes, pasta alla Siciliana (tomato, sausage, aubergine), cuscus alla trapanese (fish couscous), pasta alla paolina (bucatini with cauliflower, pine nuts and breadcrumbs), millefoglie di mupa (sea bream with breadcrumbs). Maria is world famous for her convent pastries. 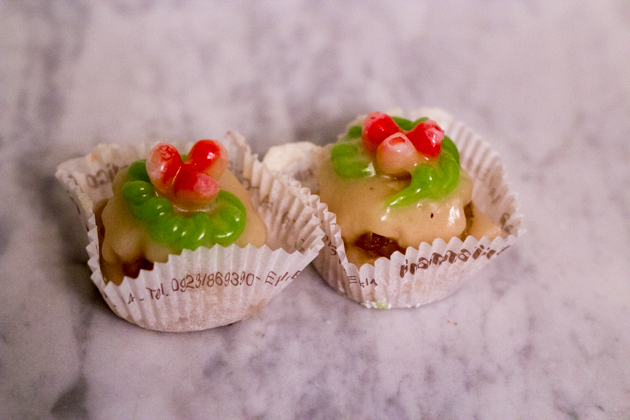 Her Genovesi (ravioli shaped pastries encasing custard) are considered Sicilia’s best as are her marzipan creations. 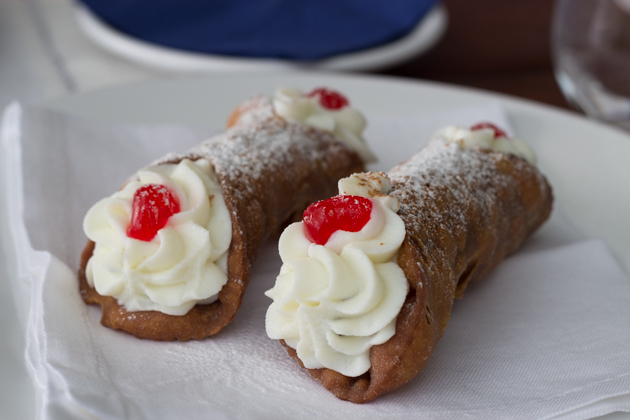 Her cannoli are also very good. 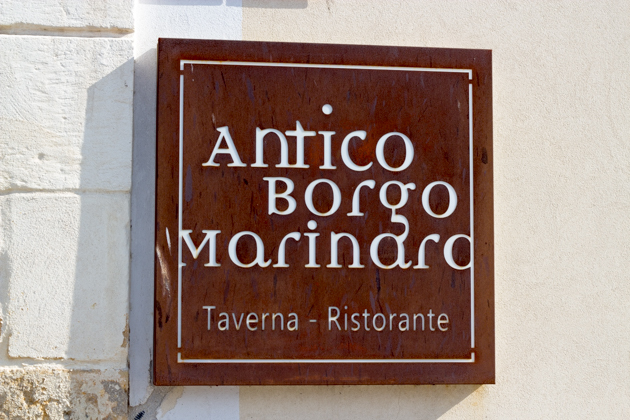 Antico Borgo Marinara‘s simple yet elegant setting creates an ambience of Arab Sicily. It’s convivial chef is obviously proud of his craft. He took the time to show us his beautiful fresh fish. You can chose a set menu or a la carte. Recommended dishes: smoked swordfish pate with olive oil and oregano, salt baked fish and the raw seafood platter. Ask the chef for his recommendation of the day. 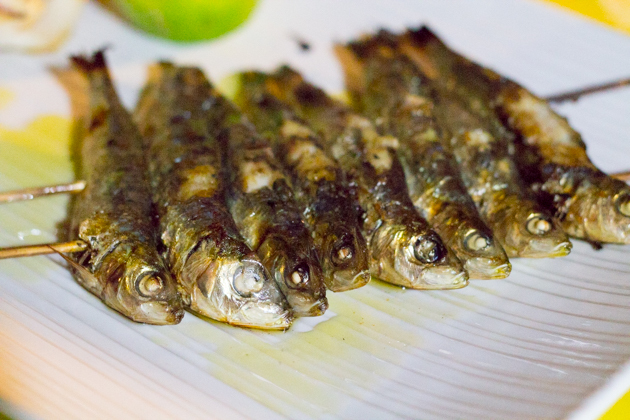 The quintessential laid back beach restaurant featuring fresh, simply prepared seafood dishes. The sea laps at the edge of the restaurant, located on the beach. It is very difficult to find because of its beach-front location. Drive through a gate which looks like it is to a park. 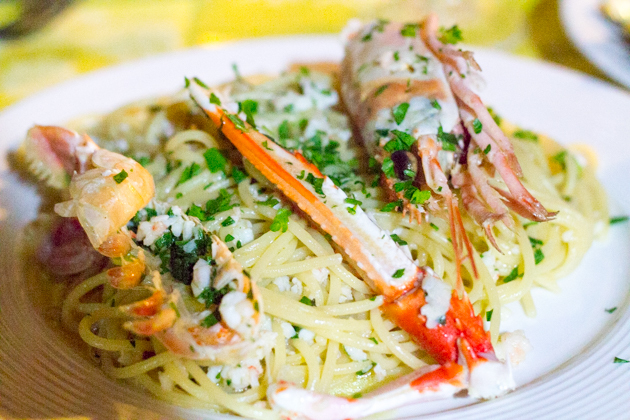 Recommended dishes: spaghetti alla marinara (spaghetti with mixed seafood), spaghetti con scampi (spaghetti with langoustines), grilled calamari, sardines and swordfish. A traditional trattoria run by the attentive and lovely Giovanni. 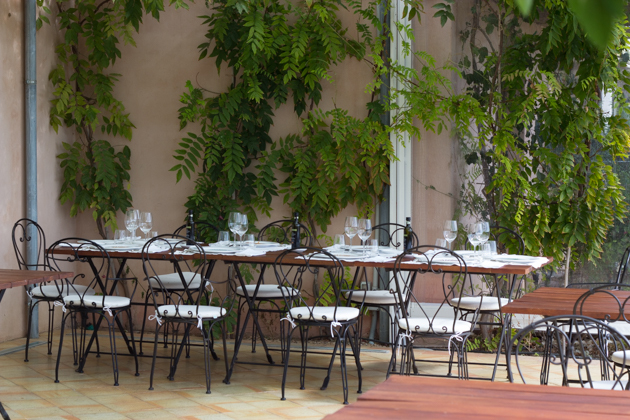 Don’t be put off by the austere surroundings, this is home cooked Sicilian food at its best. Well prepared simple local dishes. 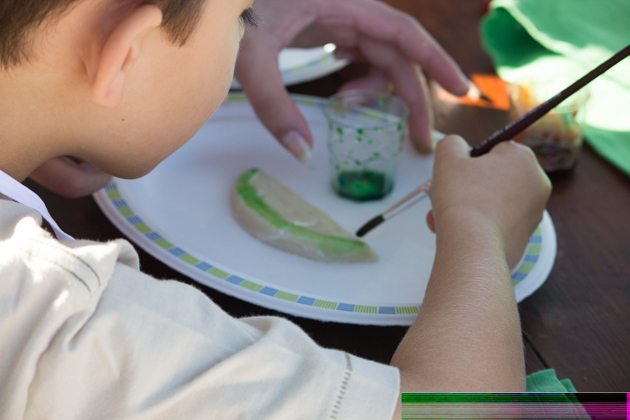 Children are treated like part of the family. As close to eating in a local’s home as you will get in food and feel. Recommended dishes: The menu varies according to what is available at market that day. 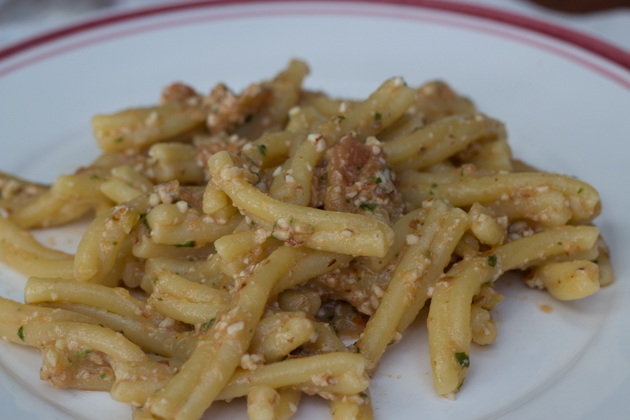 If they are available, order the pasta con ragu (pasta with meat sauce), minestra alla Siciliana (broad bean, peas and artichoke with ditalini pasta) and pork and fennel sausage with salad. This is the country hospitality component of one of the five Planeta estates with small but elegantly decorated bedrooms and an excellent restaurant set in a beautiful setting. Cooking classes upon prior arrangement. Recommended dishes: caponata (sweet and sour aubergine), busiate con pesto trapanese (fresh corkscrew-shaped pasta with tomato and almond sauce), vitello alla palermitana (veal escalope in herbed breadcrumbs) e insalata di melone (melon, fennel, anchovy and onion salad) and cannoli (flakey fried pastry filled with sweetened ricotta, candied fruit and chocolate drops). 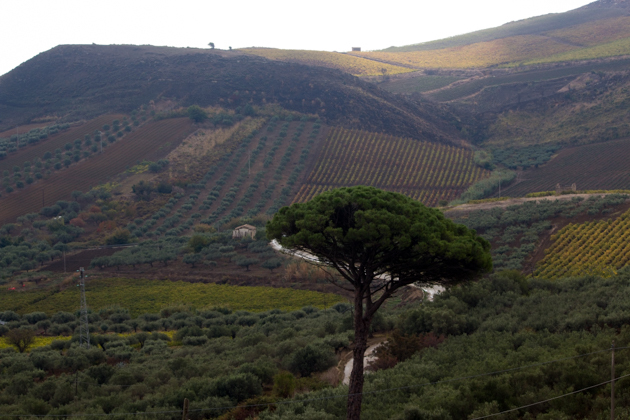 This is an association of upmarket restaurants and hotels and some of the top wineries in Sicilia. The members of the association also offer cooking classes, wine tastings, cellar tours and spa packages. Thank you for this excellent trip down memory lane; especially the reference to Erice where my production company has filmed Maria Gramatico making her famous dolci siciliani. 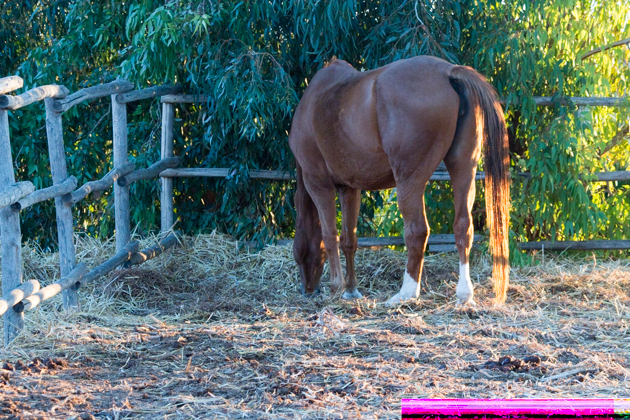 Hi Mary Ann, Thanks for reading and commenting. I am glad you enjoyed the post. 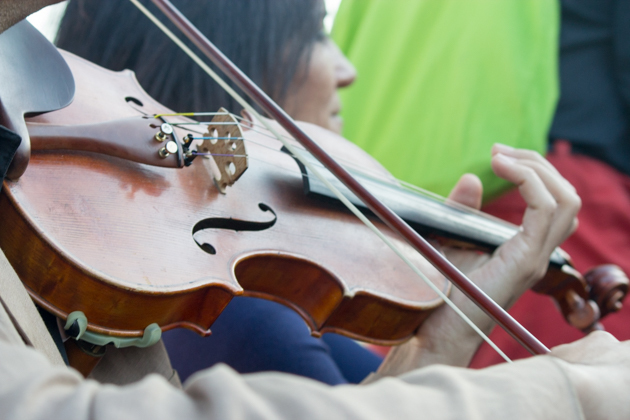 I would love to see your footage of your visit to Maria Grammatico, is it available online? These delicious pastries deserve to be world famous, so well done!